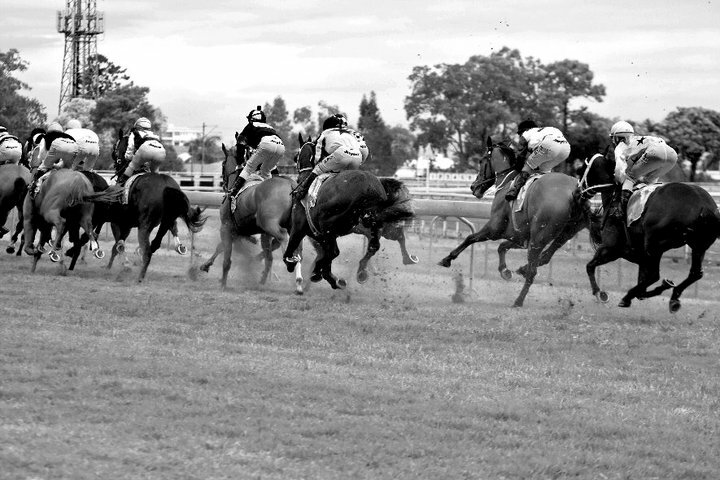 Every year we wait patiently for the 14th to come back around, so that we can drive for hours into the middle of nowhere and hit the Glen Innes Races. So that we can get all dressed up to go into town, drive for miles and miles down a never ending dirt road and bet on horses that we know absolutely nothing about. Which, considering we never go to our own local races is probably a little strange. Our family though, we kind of always were a little out of the ordinary. That’s probably why I fit so nicely. Now on this particular Saturday that we had in fact waited 2 years for this time, the weather clearly had other plans. The previously blue skies had turned black within minutes and the rays of sunshine had turned into giant drops of rain, then with the rain, came the wind. So, me being the genius that I am had the brilliant idea to swap my fancy race day dress for tights, a pullover cardigan and a scarf, and the pretty little shoes that I had picked out were of course replaced with flats. Clever, right? The rest of the town though, they clearly didn’t have the same idea. Pretty little dresses everywhere became soaking wet, hair that had been straightened and curled became a frizzy nightmare and perfectly new heels spent the afternoon sinking into the muddy grass. I couldn’t help but sit back and smile, it was definately a sight to see. Karma though, he must have seen me smiling, because from about then on I couldn’t catch a break. Actually, come to think of it, I must have unknowingly picked the polite horses from the bunch. The ones with manners. The ones who were taught to let everyone else go first, they were my horses. The polite ones, the ones who were well mannered and the ones who were not making me a single cent, because each one of my horses was no where to be seen. That is, not until every single other horse had crossed the finish line before them. Then finally, when I did fluke myself a winner, I missed out on paying the bookie by no less than a second. Not to worry though, because a race in Flemington had a pretty little horse called Lady Antebellum coming up in the next race that was sure to be a winner. So I did what any country music fan would do and I backed it. I was sure my luck was about to turn around, this was it. Karma though, he clearly still had other plans for me. Pretty little Lady Antebellum found herself boxed in and she couldn’t find her way out. Then finally when she did catch a break and she tried her best to make a run for it, she had left it a little too late and my ‘winning’ horse saw me tallying up yet another loss for the day. Brother though, he was basically a bookie himself. In fact, I probably could have won more money by paying him instead of the TAB. You could name the winner of any one of those races that day and he would have found it, backed it and made money on it. No questions asked. Chalk it down to luck: maybe. Me though, I think I must have skipped that gene. Somewhere along the way though I managed to pick up a gene that my brother didn’t; the gene with pretty little feet instead of the monkey toes. Which, considering I wear thongs more than I back horses, was definately a win. The racing idea though, I figured maybe next time I should take a leaf out of brothers book. Maybe that little booklet they give you about with all the horses in it is for reading, not for drawing pictures in. Maybe I should back the horses a little more based on their statistics, numbers and past performance and a little less on how pretty their name sounds, how shiny their coat is or how beautiful they look prancing around before the race. Maybe then I’ll have a little more luck.